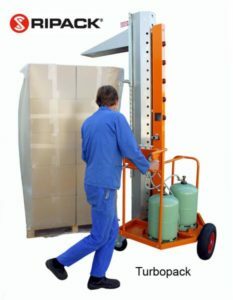 The Turbopack is a heating column mounted on a trolley, and pushed effortlessly by the operator, to achieve fast and uniform shrink wrapping on covered pallets. More than 60 pallets shrink wrapped using just one standard propane gas bottle. No load length or width limitation (unlike frames and heat tunnels) and up to 2.40 m high (2.2 m with canopy). Heating height adjustable from 1.20 m to 2.20m/2.40m. New column design enables a greater hot air flow for the thicker film. Safety device leading to the automatic cut-out of gas in the event that the control trigger is released. The Turbopack comes complete and ready to operate, with its adjustable pressure valve and its bottle connection loops. An adjustable canopy is available as an option, enabling improved shrinking of the top and the self-sealing of gussets if required. Just 60 seconds per pallet (euro type). Al Thika Packaging is the exclusive distributor of Ripack in the Middle East. Since 1994 Al Thika Packaging has been supplying shrink gun equipment, bag sealer, turbopack and consumables for food, pharmaceuticals, non-food and beverage industries in Dubai, Abu Dhabi, Sharjah, Fujairah, Ras Al Khaimah, Ajman, Umm Al Quwain, Al Ain – UAE, Saudi Arabia, Bahrain, Oman and the many other Gulf countries.